Last week, Targetprocess, SD Times, and training experts Net Objectives hosted the webinar, ‘Process or Tools? How Value-Driven Organizations Gain Visibility As They Scale Agile.’ The discussion was led by Olga Ikhelis, product specialist at Targetprocess, and Al Shalloway, CEO of Net Objectives. With 45 years of experience, Al is an industry thought leader in Lean, Kanban, product portfolio management, Scrum, and Agile design. A former SAFe Program Consultant Trainer, he not only teaches Lean and Agile methodology but also uses his expertise to help companies transition to enterprise-wide Lean and Agile practices. We were especially excited for Al to join the conversation, as we recently announced a strategic partnership between Targetprocess and Net Objectives, which will make Net Objective’s unique blend of training, coaching, ongoing mentoring, and technical consulting available to all Targetprocess customers. Targetprocess and Net Objectives joined forces for this webinar to share how Agile methodology and enterprise-ready tools come together in the real world for true business agility. Our goal was to share insights on how to provide greater visibility and collaboration as you scale Agile across large organizations to deliver more customer value. We strongly believe that Agile frameworks and project management tools should not only be used to organize work, but also to help team leaders and program and portfolio managers make better decisions and prioritize the most important work. We hoped to shed some light on how these team leaders can do this within their organizations. As organizations scale, decisions impact more people, understanding the big picture is more important, and greater visibility is needed. We wanted to dig into how organizations can integrate their Lean-Agile mindset with visual controls to make better decisions and provide consistency of intent across teams when it comes to goal setting and project planning. 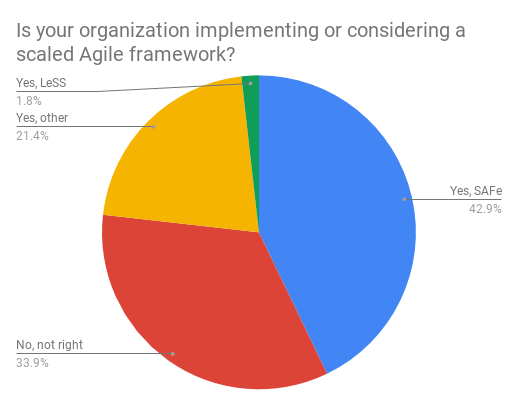 Results from audience poll question 1: Is your organization implementing or considering a scaled Agile framework? The second largest segment of this audience is not currently implementing or considering a scaled Agile framework. But the idea of scaling Agile should be valuable, not only for organizations already using SAFe, but all organizations wanting to increase visibility across teams and projects. All companies, no matter what level of Agile they have currently implemented, see the value in increasing communication and speed of development. It probably comes as no surprise that 43% of this audience is implementing or considering implementing SAFe. The Scaled Agile Framework, or SAFe®, is a popular framework because with growth comes the need to scale initiatives. SAFe offers guidance in scaling Agile practices for a company's unique needs at the Portfolio, Large Solution, Program, and Team Levels. At the end of the day, the value of implementing SAFe is to improve overall business agility. Al described the goal of business agility as “the realization of the highest business value in the shortest amount of time, predictably, sustainably, and with high quality.” The benefit of business agility is that by working in small delivery increments, you can adjust continuously to what is needed, enabling change to the direction identified at low cost. Al explained that reaching business agility can be managed by working in terms of Minimum Business Increments (MBI), or the smallest piece of functionality that can be delivered which has value to the business. Working in MBIs can help an organization reach business agility by bringing executives and team members together to decide on priorities and determine how they align to teams’ goals. Breaking priorities into MBIs is not a reason to deliver less, it is a reason to deliver sooner. Thinking in terms of MBIs is the established company’s equivalent of a startup working towards a Minimum Viable Product (MVP). MBIs aren’t typically used the first time the product is released but implemented later as an enhancement to an existing product. We found that there was a wide range of current initiatives, which all prove to be significant challenges for team leaders and program and portfolio managers. The top challenge was ‘Connecting strategic initiatives to tactical work for value delivery.’ This is where business agility really comes into play. Striving for business agility or the realization of the highest business value is extremely important when planning out tactical work for teams across the organization. And how can you attempt to tie those priorities together without a visualization of that work? 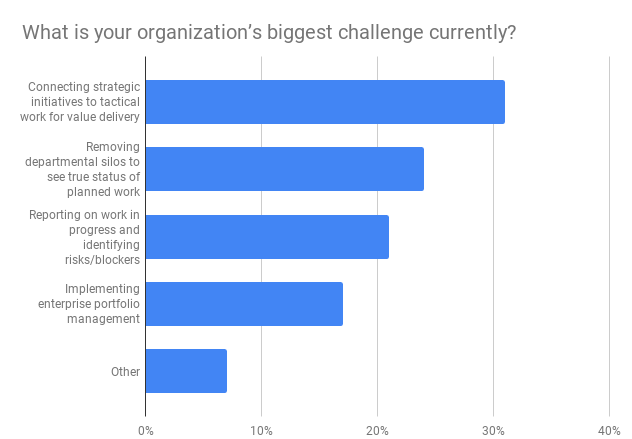 Results from audience poll question 2: What is your organization’s biggest challenge currently? Each of these challenges is clearly difficult across a variety of organization sizes and stages and are typical reasons why teams turn to Agile and other frameworks to achieve better communication and productivity. 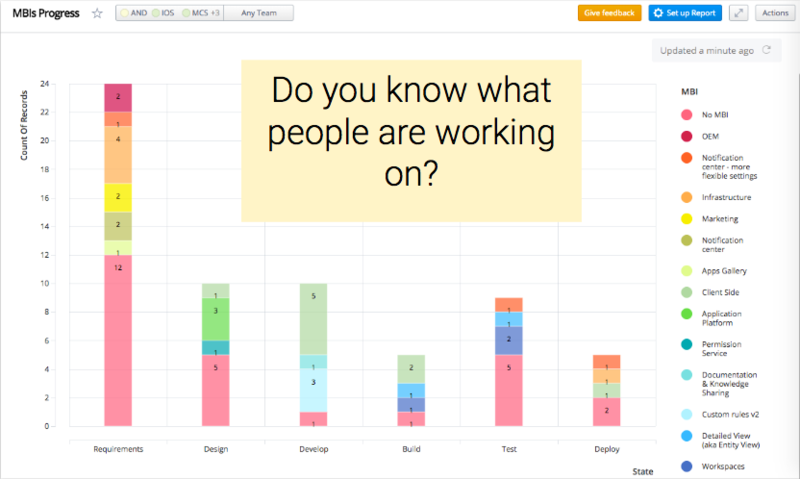 Each of these responses demands an improvement in visibility across the organization which can be provided by a visual work management tool, such as Targetprocess. Finding the right balance of Agile methodology and enterprise-ready tools is the key to reaching true business agility. Integrating visual controls to understand the big picture and provide greater visibility for executives and team members is an important piece of the puzzle when scaling Agile. Greater business agility can be reached by focusing on delivering MBIs and finding a way to connect strategic initiatives to tactical work for value delivery in a way that works for your organization specifically. Do you have the tools and information you need? Interested in learning more about how the right combination of process and tools can provide the visibility your organization is looking for? Watch the full, on-demand webinar to learn how Net Objectives uses the “Five Whys” with their clients to identify the true problem in their value stream, along with how Al suggests tying Targetprocess into your Agile work management processes. Overall, our conversation with Al was extremely insightful and we look forward to collaborating more with Net Objectives at the upcoming SAFe Summit!